PORTSMOUTH, Va.— The Coast Guard is warning mariners of navigation hazards after about 70 cargo containers fell off of a cargo ship Saturday night, about 17 miles off Oregon Inlet, North Carolina. The cargo ship Maersk Shanghai contacted watchstanders at Sector North Carolina's command center via VHF-FM marine radio channel 16, notifying them that they lost approximately 70 to 73 cargo containers due to high winds and heavy seas. One of the containers lost in rough seas off the Outer Banks Saturday night contains nearly 6,000 pounds of sulfuric acid. Sulfuric acid is a colorless, oily liquid that burns the skin on contact and corrodes most metals. But the environmental danger is minimal because the solution dissolves in saltwater, said Coast Guard spokesman Ronald Hodges, citing information from the National Oceanic and Atmospheric Administration. The container held 5,913 pounds of the acid in sealed drums, he said. The substance is most commonly used to produce fertilizer. Authorities are not certain what is in the other containers, Hodges said. The ship’s crew reported the missing acid container after an inventory, he said. It is believed to be the only lost container marked hazardous. The cargo ship Maersk Shanghai reported to the Coast Guard late Saturday that rough seas of up to 30 feet and winds up to 65 miles per hour knocked overboard about 70 of its 3,000 containers. They fell about 17 miles off the coast of Oregon Inlet. The Coast Guard has found four of the containers floating 10 to 14 miles offshore and approximately 50 miles south of where they were lost. About half of each container can be seen floating above the surface – a height of four to five feet, Hodges said. A C-130 aircraft crew continues the search. Hodges said it's not known whether the sulfuric acid is in one of the four found containers. The ship is anchored in Charleston, S.C. where company officials and the Coast Guard are assessing damages, said company spokeswoman Katherine Mosquera. The vessel is flagged in Liberia, she said. "We will be in contact with all customers with direct impact to find the best solution for the handling of their cargo," she said in an email. In 2016, Maersk shipped 13.2 million full containers and lost 23 overboard, Mosquera said in an August 2017 Virginian-Pilot report. The company loses about 60 containers on average annually, she said. 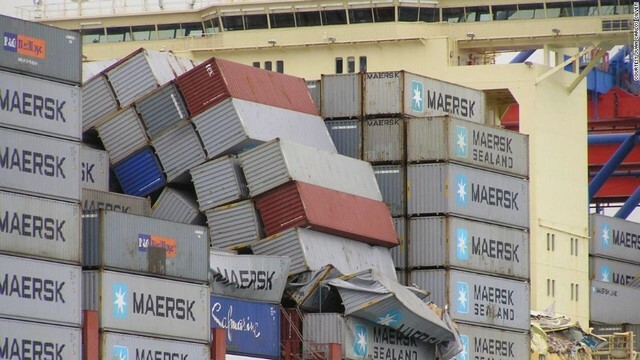 In 2014, Svendbord Maersk lost 500 containers in extreme weather caused by a hurricane. A survey by the World Shipping Council found that from 2008 through 2016, an average of 568 containers were lost at sea each year, according to the August report in The Virginian-Pilot. Including catastrophic events when 50 or more containers are lost, the average rises to 1,582 a year. In 2006, a container filled with thousands of bags of Doritos washed up in Frisco, attracting dozens of scavengers. It remains a popular talking point on the Outer Banks. The Coast Guard urges all mariners to travel the area with caution. Anyone finding a container at sea can call the Coast Guard at 757-638-6637. People onshore can also call Dare County at 252-473-3444.